OUR WORLD IS FILLING UP WITH DIFFERENCES. And this is a good thing, for some of these differences advance the cause of human dignity. Plenitude embraces those who would otherwise be persecuted for their difference. Better, plenitude dispenses with "permission." No one needs the liberal generosity of the mainstream to exist. It is enough merely to stake out a social space and to occupy it. Plainly, this is to the good. But plenitude should also give us pause. It has a darker side, as we have seen. It is capable of creating horrifying aberrations. Plenitude allows (encourages?) the "mustering" of paramilitary groups who cultivate their own deeply skewed notion of the world. It forgives (encourages?) a world so decentred, so without powers of withering, that even the bombing of federal office buildings in Oklahoma City can seem plausible. Plenitude permits (encourages?) the monstrous. We have a choice. Plenitude can create the glorious or the monstrous.It depends on what we do with difference. It depends on what difference becomes for us. Traditionally, difference has been a path to identity paved with hostility and antagonism. It has given us a "sharpener" of identity and a recipe for action: find the odd man, the odd group, the odd nation, the odd culture, and then: mock, repudiate, assault, and, too often, exterminate. (Stalin, Mao, Hitler, Amin, Pol Pot eliminated difference by eliminating people, tens of millions of them. They made our century a slaughterhouse.) This approach to difference has used it to sharpen identity through contradistinction. We are what the other is not. Worse, our path to definition may be found through acts of differentiation, antagonism, and hostility against the other. By this reckoning, things look rather grim. More difference can only mean more antagonism. If we are filling up with differences, we will find ourselves surrounded by otherness and increasingly called upon to challenge it. New and emerging identities will put our own in question. Our identity will depend upon the defacement of their identity. Plenitude's world has the potential to make us smaller, meaner, more loathing, and more loathsome. And we are the God-fearing folk. It will be worse for others, the bigots and the hatemongers.These people will find themselves so provoked by the rising tide of plenitude that any act of opposition will seem tolerable (and psychologically necessary). In the small scale, they will persevere in "fag bashing." On the large, they will target still more federal buildings. But there is another use for difference. In this case, we use difference as a definitional opportunity. We say of otherness, "Wonder what that's like?" We venture out and try otherness on. This has always been the spirit of Mardi Gras and other liminal moments. But I think there is good evidence that our entire culture is shifting in a transformational direction. More and more, we are prepared to try on difference, to test it out. This is a radically new approach to difference, one that completely shifts the field of assumptions. In the old sharpening model, we use difference to push off against. We are not what the other is. In this new transformational model, we use difference as a definitional opportunity. We use it as a shape to try on and act out. Our most fundamental reflexes are rewired. When we see a new species of social life (Dennis Rodman, say) we no longer say, "Weirdo! Get 'em!" We say, "Um, that's pretty strange. What's it like to be like that?" We move from difference as contradistinction to difference as definition. We move from difference as sharpening to difference as shaping. Difference is less and less for "pushing off," and more and more for "trying on." This "tilt towards transformation" is the topic of book 2 in the series. I will develop it in detail there. Here I want merely to note a double possibility. As plenitude takes hold of us, we can move in two quite different directions. We can pursue the old course, the one that uses difference as cause for alarm, hostility, and contest. We can pursue the new course, the one that uses differences as cause for transformational opportunity. Almost certainly, we will pursue both. And this too will prove, as everything seems to, yet another engine for our plenitude. There is a second reason to be frightened. Plenitude challenges our most fundamental ideas of social and political association. What be-comes of the "common good" in a body politic that has precious little in common? What happens to the "community" when it fills up with differences? How can we hope to act in concert when we are speciating so intensively and so extensively? I wish I had a clever answer. I have what is merely a sneaking suspicion.There is a common culture that unites the world of plenitude. It is, I think, and this will please no one, the marketplace. This is the great lingua franca of the contemporary world. As long as we can meet somewhere in the exchange of something for the benefit of someone, we have a foundation that can sustain plenitude. I understand that this is a provocative Color position, and, for some, a lunatic one. There are those who say the marketplace is the enemy of plenitude and of the realization of human potential. Those who can endure the marketplace insist that capitalism is the problem. And those who will endure capitalism say that it is the consumer culture that is at fault. This last culprit is said to narrow choice, falsify needs, poison consciousness, blunt creativity, and block the real exploration of humanness that plenitude might otherwise make possible. But the striking thing from an anthropological point of view is that capitalism is a little like plenitude. For a great many purposes, it doesn't care (or specify) what must happen, just that something does. There was a time in the history of computers when we talked about how small was the "kernel" that a program demanded. We wanted something small and generative that could manage with as little memory as possible. In a sense, capitalism is like this. It demands relatively little space. From relatively few assumptions any number of outcomes prove possible. It is, forgive the pun, so "economical." There was a period of confusion in the history of capitalism when this was not clear. In the 1950s in particular it appeared that the marketplace could only work if producers and consumers participated in monstrous acts of conformity and containment. But the 1960s demonstrated the falsity of this assumption. Capitalism doesn't appear to need certain kinds of conformity. Indeed, as we enter the 1990s, capitalism appears happiest and most productive when certain conformity rules do not apply. Things that seemed essential in 1955 (e.g.,what the neighbours thought) turn out to be "things indifferent." From another point of view, one that I do not wish to obscure, this is all perfect nonsense. The economistic mentality contains a toxin that puts plenitude at risk. As long as the entire enterprise depends on a "means-end" rationality and an instrumental logic, there are certain acts of imagination and invention that may not be allowed to happen. Just as clearly, the true creative powers of the species are held in check. The expressive potentials and the instrumental imperatives of capitalism are daily at odds with one another. They collide every time creative teams in Hollywood, Madison Avenue, Broadway, or Burbank sit down with "suits" who demand deference to the monarch ROI (as "return on investment" is called ­­ usually without a trace of irony). To this extent, the marketplace is the enemy of plenitude. It is reductive, diminishing, and antiplenitudinous. As the phrase has it, it all comes down to money. I accept this but I cannot ignore the fecundity I see around me. Capitalism has endured, enabled, perhaps provoked the speciation we see around us. It is, as we have noted, particularly unparticular. It doesn't care what it does. It doesn't care what we do. The strangle-holds of hierarchies and elites count for less and less. And capitalism is nothing if not transformational. It is capable of astonishing cultural transformations, including, for instance, turning labour into soap, soap into solicitude, solicitude into gender, gender into society, and society back into soap.And it is restless, inventive, and novelty seeking. (Or is this just the modernism within? More on this in book 3.) It throws off innovations ceaselessly. The consumer culture is a cause and a consequence of plenitude. Certainly, there are some cultural and social arrangements it will not allow. Just as certainly, there is a truly breathtaking array it will. As the phrase might have had it: it all comes up from money. I do not solve this issue. But I do wish to show, in a way that social scientists (even under the influence of Simmel and Polanyi) normally do not, that capitalism is not always the villain of the piece. I wish to show that it is as often as much the agent of plenitude as its enemy. This is especially important to grasp when we are wrestling with our options in a society fully captivated by plenitude. For it is clear that as our speciation goes forward we are going to need something ­­ imperfections, warts and all. Capitalism may not be a baby we can afford to lose with the bathwater. We see already that capitalism reaches across cultures quite successfully.I do not want to ignore the horror of colonialism ­­ only to observe that Japanese and American businessmen now routinely conduct mutually satisfactory business deals without necessarily undoing the cultural differences that exist between them. Once more, capitalism does not care about these differences ­­ they are truly "things indifferent." What works across the cultures appears to be workingwithin cultures ­­ at least within the culture of commotion. As our own species multiply, we continue to have something in common. Capitalism provides the few and unspecific instructions that allow discourse to happen without specifying, within certain limits, what must transpire there. We have reason to be frightened of the world that plenitude is constructing for us. But it is also true that there may be a net to catch us when we fall. Plenitude will continue to spin off more, and more different, species of social life, but that does not mean that we are headed to Lasch's Hobbesian war of all against all. It doesn't mean that we are headed towards a postmodernist world in which meanings collapse, evaporate, or collide. It doesn't mean that commonality cannot be fashioned. It doesn't mean that these very different species cannot work out some system of mutual recognition that leaves their differences uncompromised. The marketplace is not a perfect solution.It is never a pretty solution. It is rarely a just solution. But it is rather better than the alternative ­­ a tyranny or tower of babel we can none of us survive. Finally, I think the thing we most have to fear is amnesia ­­ our well-practised ability to forget what we know about ourselves.We come to terms with one part of the culture of commotion (what is happening to gender, say), but we forget this when we take up another part (what is happening to spiritual belief). And we forget both of these when we sit down to contemplate the tremendous innovations taking place in the worlds of scholarship, business, or art. By systematically forgetting what we know about the disparate pieces of our society, we never have to come to terms with the revolution that is taking place throughout it. Huyssen has called us a "culture of amnesia," and we are especially that when it comes to reckoning with the plenitude in our midst. The real danger is that by insisting on the partial view, by selectively forgetting what we know, we need never come fully to grips with the new realities of our world. And it is this amnesia that frightens me most. Plenitude is upon us. It will not go away. It will continue to transform everything about us. It is time to see it whole. 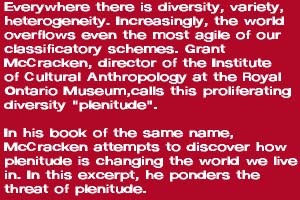 Grant McCracken's Plenitude, (from which the accompanying piece is excerpted), can be downloaded directly from www.cultureby.com in Adobe Acrobat format. A printed and bound edition of this fascinatiing book can also be ordered at the Plenitude web site. Copyright © 1995-1998 Circuit Traces Communications. All rights reserved.